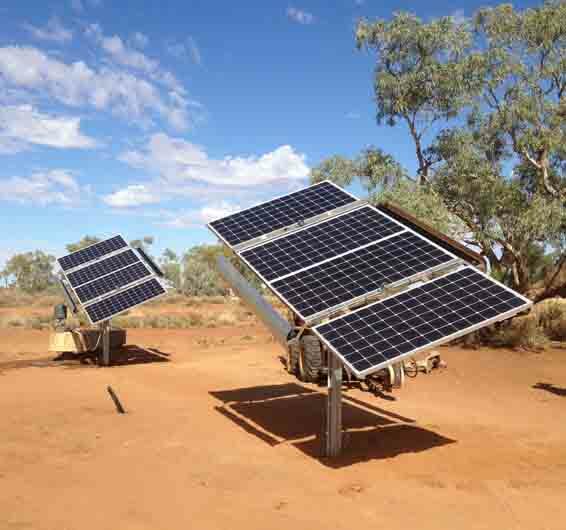 Northwest Hydro Solutions are the solar pumping specialists throughout the Kimberley and Pilbara regions. At Northwest Hydro Solutions, we provide specialist solar water pump services, using only high quality parts and components from trusted suppliers such as Grundfos, Mono and Franklin. A highly efficient water pump option, solar pumps are specifically designed to provide you with sustainable, long-term benefits. Our team design, supply and install solar shed pumping systems specific to your water needs using quality Grundfos products. Solar pumps and panels are now available for purchase in our online shop including our cost effective Do-It-Yourself Solar Assemble Kits. Could you benefit from Solar connected to your bore? Try our FREE ‘try-before-you-buy’ Solar Trailer System. Complete with 8 Panels, this easy to use design can hook straight up to your current bore. Simply plug in and play! Connect each panel to test the solar capabilities against your system according to the depth, water level and flow rate of your bore. Allowing you to determine the correct number of panels required for a more permanent solar install. Protect your equipment with a Solar Shed! Our in-house designed solar sheds are the perfect solution for remote pumping stations. Once installed, the shed can be positioned to protect the pump equipment from the elements and prevent wildlife damage with the added benefit of additional storage inside the structure. Our Solar sheds are made to order and come in a range of sizes according to the number solar panels required. Solar Panel Systems made easy. Our in-house designed DIY Assemble Solar Kits are tried and tested. Once installed you are ready to pump. Simply follow the simple installation guide and you’re on your way! Contact us for more infomation! How to correctly select Solar Pump & Panels. Click on the links below to access our how-to-guide and pump sizing information. Flow Nomogram for Polyethylene Pipes.